Archimedes (ca. 287-212 B.C.) - The greatest scientific mind of the ancient world (I don't even think it's arguable), Archimedes was a Greek who lived in the Sicilian city of Syracuse. We don't know exactly when he was born, but we know he died during the Second Punic War, probably around 212 B.C.. And there is a Byzantine historian named John Tzetzes who wrote several centuries later that Archimedes died at 75 (how he knew that, we have no idea). But accepting it as accurate, it would have him being born sometime around 287. Outside of his career work, we don't know a lot about his personal life. Most of what we do know comes from Polybius, Livy and Plutarch. He had a friend named Heracleides who wrote a biography which is now lost. Perhaps these historians had access to this biography, but they did not include many details of his life in their writings. 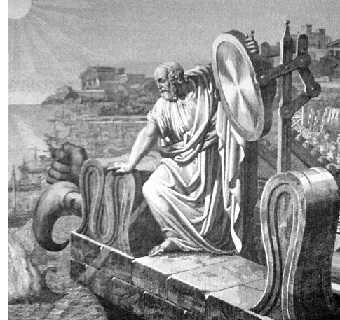 In one of his surviving works, The Sand Reckoner, Archimedes identifies his father, Phidias, as an astronomer, which might explain his scientific curiosity. Except for a brief stint in Alexandria where he studied at Euclid's school, he probably spent most of his life in Syracuse. His body of work is no less than astounding. He correctly formulated the principal of the lever, and famously said, "Give me a place to stand and I can move the earth." He is credited with the invention of the screw pump (now known as Archimedes' Screw) used to raise water uphill, and still in use in some Third World countries. He discovered the method of exhaustion to determine the area of irregular shapes, seen by many as a precursor to Calculus. He calculated π to a remarkably accurate value, and may have been the first to do so (though this is in dispute). He invented an early odometer. In one of his most famous moments, he is said to have run down the street naked shouting "Eureka!" (εΰρηκα! ), which means "I have found it!" after discovering the principal of displacement while sitting in a bathtub, allowing him to measure the volume of objects. This is just a fraction of his contributions; the list is so long, it would become boring. He devoted much of his talent to trying to fend the Romans off from capturing Syracuse. At the time of his birth, Syracuse was an independent Greek colony, but his efforts ultimately did not succeed and Rome eventually incorporated all of Sicily into its empire. Some of his more fantastic sounding creations were a giant claw which came out of the sea, grabbing Roman ships and immobilizing them. Perhaps even more remarkable was the tale of an ancient type of laser, where he concentrated a series of mirrors onto a single point, catching a sail on fire and burning the ship. Though neither of these have been successfully duplicated in modern times and may have been legends. Plutarch provides the account of his death. The Romans invaded Syracuse in 212 B.C., under the command of General Marcus Claudius Marcellus. Marcellus wanted Archimedes taken alive due to his obvious value. 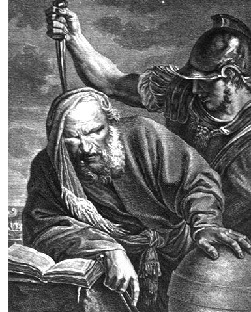 When a soldier caught up to him, he found Archimedes working on a mathematical problem. The soldier ordered him to come with him to the general. But Archimedes declined saying he had to finish solving the problem. In anger, the soldier struck him down with his sword. His last words reportedly were, "Do not disturb my circles", referring to the problem he was trying to solve.